The Word “Tez” Means Fast In English. After Demonetization In India, Many Companies Started Their E-Payment Service In India Via Mobile Apps. Recently, WhatsApp Announced Payments Or Business App For Small And Big Companies. Google Already Has A Large Number Of Users Across All Of Its Products And Service. With Plan To Introduce A Digital Payment Service, Google Is Going To Launch Its Payment App Called “Google Tez” As Soon As Next Week. This App Will Be Different From Other Apps. Currently, In Indian Market, Many Users Use PayTM, Mobikiwik, Jio Money, Phone Pe Apps To Make Payments. 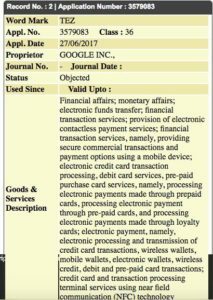 Google Tez May Include Comprehensive Set Of Payment Options Beyond Its Existing Payment Products i.e. Android Pay Or Google Wallet. Tez Will Include Support For Unified Payment Interference (UPI) That Is Already Offered By Indian Government’s Official BHIM App. 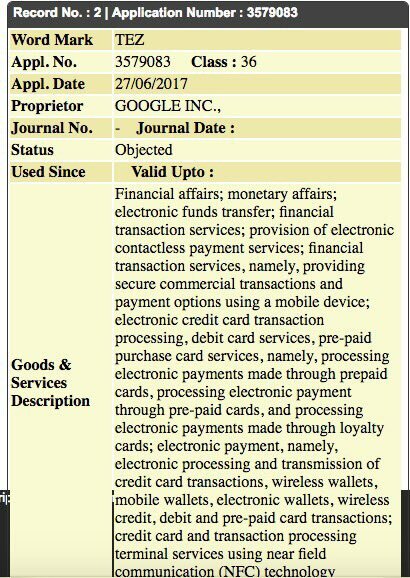 UPI- Unified Payment Interference-“A Payment System Backed By The Government. Tez May Also Include Third Party Payment Service Including PayTM, Mobikiwik. This Will Provide Fast Payment Service To Indian Users. Google However Has Not Pushed Payment Service Outside Of United States. Google Has A Large Number Of Users In India, Earlier This Year, Google Launched Its “Areo” App That Provides A Food And Home Service To People. With Cheap Data Plans, Android Phones, There Is A Fast Growth Of Internet Users In India In Recent Years. According To A Report, Digital Payment Space Will Be Of $500 Billion Per Year By 2020. The Tech Giant Google May Have Expansion Plans Too, Google Has Registered Trademarks For Its Tez Product In At Least Philippines And Indonesia Also. Google Provide A Lot Of Its Product And Services For Developing Countries’ Like Recently Announced Xiaomi A1 Powered By Google. Google Is Also Going To Launch A Light Version Of Android OS Called Android GO Next Year. Lite Apps Like Triangle, Search Lite Also In Testing And May Include In Android GO. According To The Ken, On Monday, 18 September, Google Will Enter Into Fastest Growing Digital Payment Ecosystem By Releasing Google Tez, A Payment App.